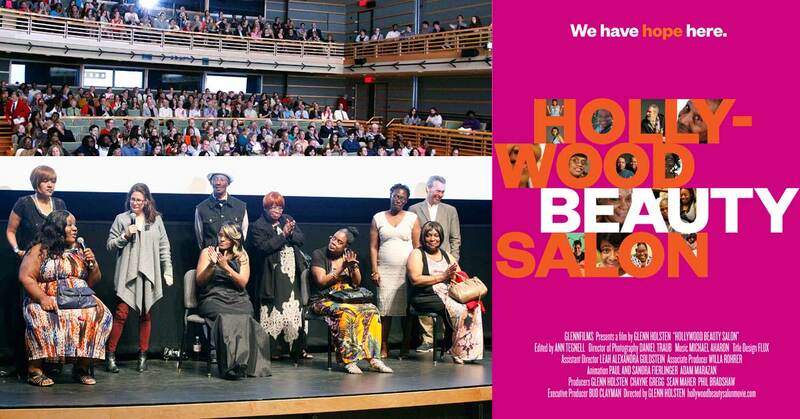 HOLLYWOOD BEAUTY SALON is a new documentary film about an intimate beauty parlor inside of the Germantown Recovery Community, a non-profit mental health facility in Northwest Philadelphia run by NHS Human Services. The Hollywood Beauty Salon is run by Rachel “Hollywood” Carr Timms. Staff and clients alike are in the process of recovery — openly discussing their mental health issues but also refusing to be defined by their diagnoses. By gathering together to get their hair done, share stories, and support one another, they find a way to rebuild their lives. Rachel is truly the soul of the salon. She is a Recovery Guide and a Certified Psychiatric Rehabilitation Practitioner who uses her own journey with mental health challenges to connect with — and advocate for — her clients. Rachel has been on her own since high school. She has fought to overcome depression, post-traumatic stress disorder, and anxiety. Her commitment to recovery began when her daughter, Cadence (now 15 years old), was born. 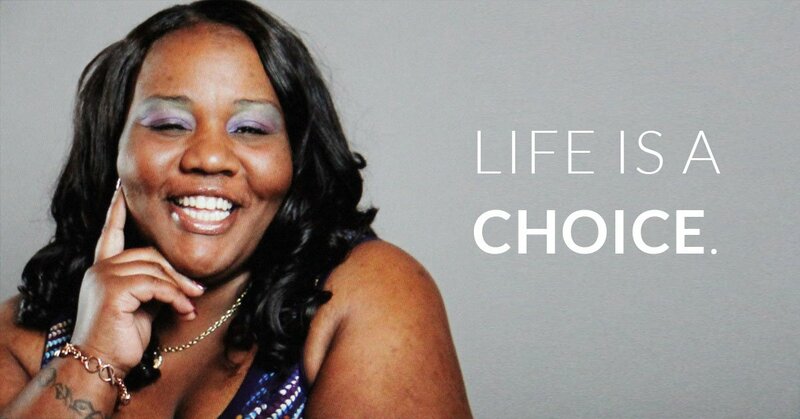 Her story anchors the film, just as she anchors the Hollywood Beauty Salon. The documentary is built around preparations for the members’ annual “Hair Recovery Show,” an exciting undertaking that allows us to meet the characters and hear their stories. The film — which was work-shopped at the Salon over the course of four years — is also part of the recovery process, and the subjects of the film played an active part in shaping their own narratives and determining their own unique individual styles. The film recently had its premiere screening at the Kimmel Center in Philadelphia. The screening was followed by an emotionally charged Q&A with cast members. Telling your story to a friend is one thing. Sharing it with a general audience is quite another. Director Glenn Holsten sat down with Rachel “Hollywood” Carr Timms soon after the screening to discuss experience of watching the documentary unfold for the first time on a big screen in front of a sold-out audience. Glenn: So, Rachel, what was the experience like for you? Rachel: It felt good. One of the things I struggle with, I guess, is giving myself acknowledgement for good things I do. When I was watching the film, I was thinking that “I can’t believe I did all that. I can’t believe that I have that kind of impact on people.” For the first time in my life, I think I felt proud of something. As a mom, you feel proud of your children, but this was a different kind of accomplishment. I saw some of my dreams coming true. That’s the first time that ever happened in my life. Glenn: One of the questions we all ask ourselves when we’re doing something like this is – is it worth it? Is it worth the energy and the time? Did you reflect on the process at all? I mean, it’s been years since we’ve been working on this. Rachel: Well the process was difficult, and I started to feel impatient — like, “Oh my God, when is it going to come to an end?” I didn’t know how it was going to come together, but it just shows you that with patience and dedication, if you really believe in something, your dreams can come true. Glenn: That’s funny. And true! As you were watching, what were your thoughts about your other “classmates” in this production class — the other folks in the movie — Crystal, Anthony, Darlene, and the others? Rachel: One of the things that kept me going with the film is seeing growth in the people I was working with. 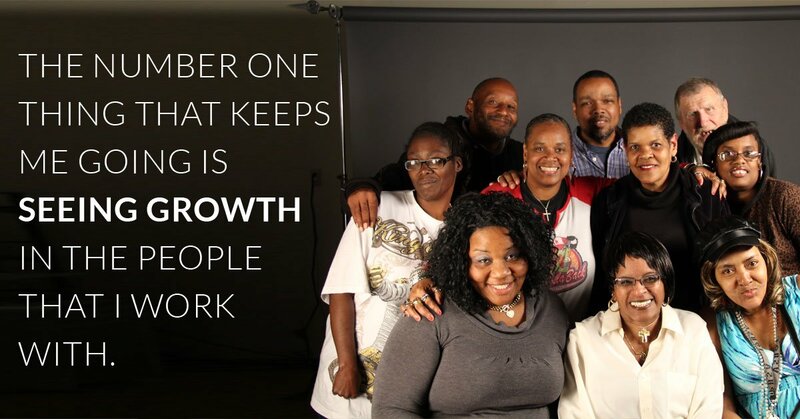 Actually, that’s the number one thing that keeps me going all the time — is seeing growth in the people that I work with. Seeing them meet their goals, seeing them become more beautiful people — not just outside but the inside as well. Seeing them take care of themselves — personal care, taking care of their business, going to Social Security, advocating for themselves, sticking up for themselves for things that they did like or didn’t like. And through helping them — you know I’ve been through a lot of trials and tribulations myself — it actually helps me continue to keep coming here and they continue to keep growing. Glenn: When you were in the theater, did you feel the people around you watching? What was that sensation like? Rachel: It was a surprising experience, because I’ve never been to a movie theater where I had people in the audience clap after people in the film told their stories. It showed me how empowered and moved they were. And I think it was great. Any time you stop in the middle of a movie and applaud, that really meant something. Like when they applauded for Mr. Kozempal [one of the people in the film who works hard to play his flute again after many years of struggle], that really meant something to see his progress. So it just made me smile. Glenn: You had some very wise comments during the Q&A about forgiveness. What moved you to say those words? Rachel: I realized that participating in this project was part of my forgiveness process. And it wasn’t until I saw the edited movie that I realized that it was a release. You’re putting it out there. Once your story is told, and people can benefit and learn from it, it’s a release. As long as I held it in me and kept it in my mind, you know I felt bad about it. Every time I see my story, it hurts less and less. So forgiveness is for you. It’s not for other people. Sometimes you can get caught up on in wanting people to pay for things they may have done, but that doesn’t take away from what happened to you. Forgiveness is definitely for you. And it helped me grow. Before I met you, Glenn, I wouldn’t have told my story to anybody, besides people who are close to me — perhaps my husband and my daughter. Other people don’t know what happened to me. That I was shot and that I went through those things. Everybody sees me as this particular kind of person. But it took me going through those things to be able to be who I am now, you know? And I wouldn’t change it. I think I’ve said that already in the movie. Glenn: What were your fears about participating in the film, and in what way were those fears conquered or realized? What were you scared of along the way and how do you feel about those fears now? 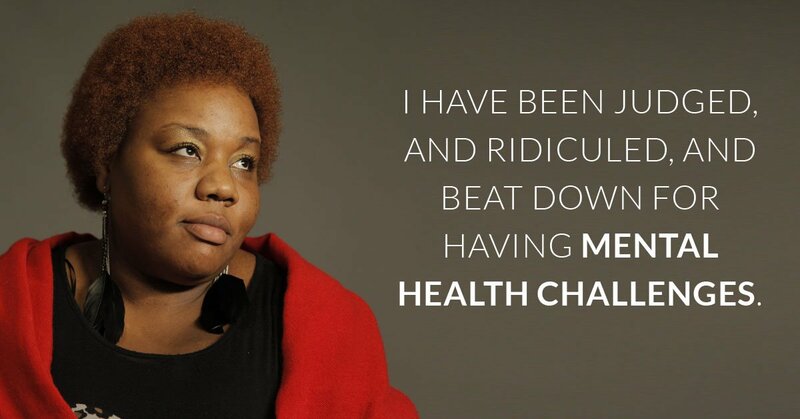 Rachel: I have been judged, and ridiculed, and beat down for having mental health challenges. I have been judged, and ridiculed and beat down for helping other people and caring about the things I care about. 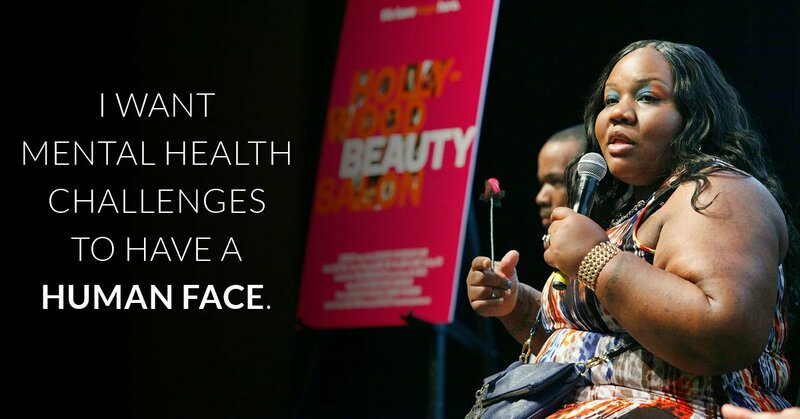 In the beginning stages of creating the beauty salon I remember hearing questions like “Why do you care so much about how people look?” To me, that was the key for them wanting to change inside. Once a person felt good on the outside and they looked good on the outside, it would actually change how they would walk or smile or feel that day. Building their self-confidence. One of my fears with the movie was just being judged. Believe it or not, I got a lot of criticism and feedback from people who saw the trailer and clips. “Why would you talk about that? That’s over now.” It made me feel bad. But then I had to remind myself why I did it — because I wanted somebody to learn from what I’ve been through. Maybe I could help somebody who is in the same situation as me. Or maybe somebody could speak up for something that they’re going through that they are keeping inside themselves that they’re not getting help for. Maybe one of the women in the audience is in an abusive relationship and maybe she went home and left it because she realized that she was important after seeing me going through what I went through. And that she’s worth more than getting her behind whipped and hurt or even killed. Glenn: There was definitely empowerment going on. People in the audience stood up and testified about their own lives. I think they were emboldened by the film. Rachel: I’m not always a brave person, but I felt brave doing this. Because after I had those doubts and even when I was ridiculed, I was able to say “You know what? I started this and this is what I want to do, and this is in my heart and this is what I’m going to do.” In spite of my own issues and challenges that were telling me something different. There were times when my mind and my heart were in battle because of the negative feedback. We all want approval, especially from people we care about, so it’s hard when you don’t get the response you think you’re going to get. I realized in the African American culture, unfortunately, people are still being told to keep secrets. There’s this idea of “Oh, it’s your family’s business, don’t tell.” They’d rather that children get molested and grow up as women with trust issues, scorned and bitter who continue to put themselves in the same situations, just because they don’t want their families to look bad, so that story is not told. Instead of allowing a woman to be free and to be healed from being a victim, they’d rather them be quiet about that so that they’re family is not embarrassed. At what cost? Damaging women? Damaging children? No. I want it to be the opposite way. I want people to speak out about what happened to them. 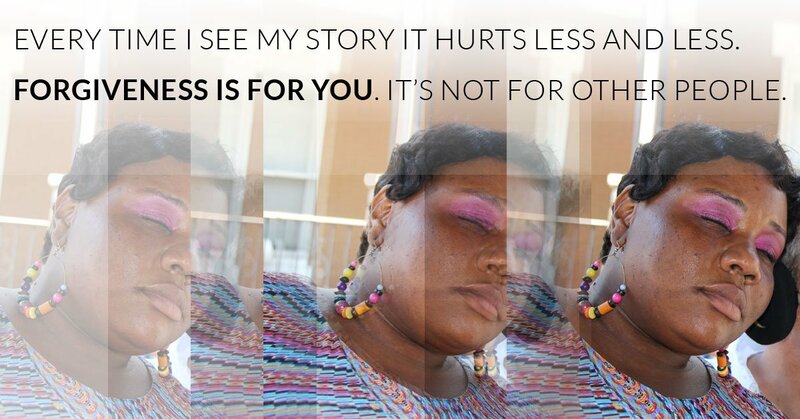 Maybe there was a little girl in that theater who was molested or touched or treated wrong, like in Darlene’s story about her experience in foster care. I just hope that our stories reached somebody. Like Anthony said, “We are not our diagnosis.” One of my main reasons like we talked about so many times is that when you’ve got a bigger picture for something. You think about why you’re doing something. I did it because I want stigma to go away. I want mental health challenges to have a human face, and for people to be looked at not as their diagnosis, but looked at as human beings. God made all of us. Unique. All our different ways, all our different complexions. Nobody is exactly the same. Everybody’s different in their own way and they all got gifts to offer to the world. You know, sometimes people with mental health challenges are the better people because they are humble and they are understanding. And they want acceptance. Glenn: You are beautiful. And you are brave. And I can’t thank you enough for going along on this journey with me for the past four years. It was a thrill to sit in the theater with you and watch the film together, but it was even more of a thrill to listen to you at the Q&A afterwards. I really think this brings out the best in you.